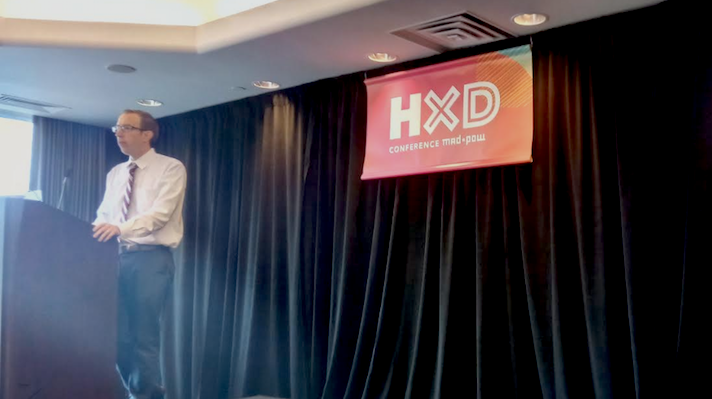 Every patient experiences mental illness differently, but as technology becomes more ingrained in people’s lives, it’s easier to track behavior and how that correlates to mental health, John Torous, MD, co-director of digital psychiatry at Beth Israel Deaconess Medical Center said today at Mad*Pow's Health Experience Design (HXD) Conference in Cambridge, Massachusetts. Sometimes patients are even more honest with an app on their phone than they are with their provider. For example, Torous referenced a study he was involved in a few years ago where patients were asked nine questions over 30 days. In that survey, researchers found that patients were reporting more suicidal thoughts to the app than to their provider. "No one wants data. People want insights and action." This data raised a lot of questions about the patient-provider relationship and technology. There’s still no answer to these questions, he said. But one thing is clear, phones can provide clinicians and with a lot of data. “You can almost get a digital fingerprint based on the raw data that the smartphone is producing,” Touros said. But that data can be clunky and difficult to interpret. That’s why Torous said its important to think about adding new staff to deal with these questions. Torous noted that it is important not to let the technology interfere with the patient and clinical relationship. On the patient side, he said many people are interested in tracking their health. For example, one of his patients with schizophrenia uses technology to track if his medication is working by monitoring the drugs he is taking in relation to how many voices he is hearing everyday. But in the long run, this technology is still new and could go beyond just identifying mental health conditions. Torous and his team will be starting a small digital clinic at Beth Israel this fall and LAMP will be a part of that. As the technology pushes forward, Torous reminded the audience that it's best to make sure the patient is still at the heart of the work. “Sometimes the people that we work with have the best answers and solutions,” Torous said.